The MX record defines the IP address/alias of the server registered for the given domain name. The MX stands for mail exchange and handles email communication. MX record indicates which computer is responsible for handling the mail for a particular domain. You can have multiple MX records for a single domain name, ranked in preference order. If a host has three MX records, a mailer will try to deliver to all three before queuing the mail. Record FQDN Record Type Record Value MX Pref. An “A” record maps a domain name to the IP address (IPv4) of the computer hosting the domain. After everything is set, go over to SMTP Servers. On this page the list of all registered SMTP servers in contentACCESS can be found. It is also necessary to set here the domains that should/shouldn’t be used in SMTP archiving. If a domain is not white-listed here, it can‘t be later used to create SMTP Mappings and therefore for SMTP archiving. It is possible to set automatic deletion of files (locally stored on SMTP) after clicking on Edit in the context menu of the servers on this page. On the SMTP Mappings page the user has to map email addresses. The SMTP will archive emails based on the created mappings. The Email address will process the incoming emails and archive them to the specified folder in the Entity. 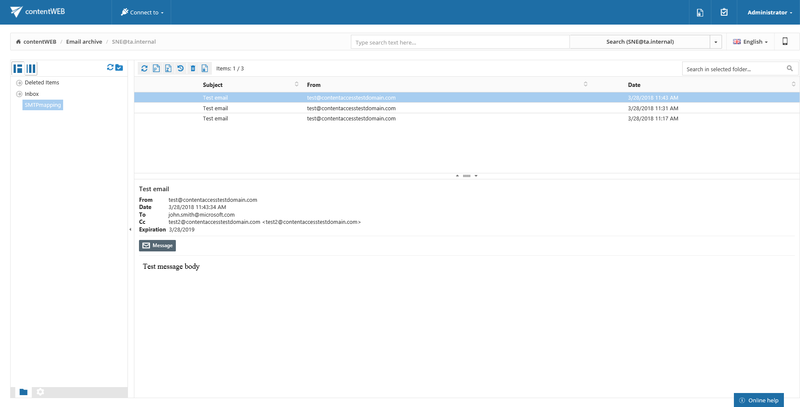 Only mailboxes with assigned Archive database and Store in the Address book can be used as Entities, however, dummy mailboxes can be used as Email addresses. Note: To learn how to manually create mailbox(es) in the archive for SMTP archiving, please check this section. Important: One Email address can be associated only with one Entity! However, one Entity can be associated with multiple Email addresses. The archived emails won’t be visible in the mailbox directly, but they can be viewed and worked with in contentWEB.